Their photo, to get a better idea of the size & whole picture. From Elves & Angels website. I was initially offered Jenny’s kitchen. It’s the most economical of the wooden kitchen’s I’ve found, and I’ve looked at lots of them. They’re offering it for as little as $169, with free shipping which is a really, really good deal! I had a hard time saying no to that offer but we already own a very similar looking kitchen. 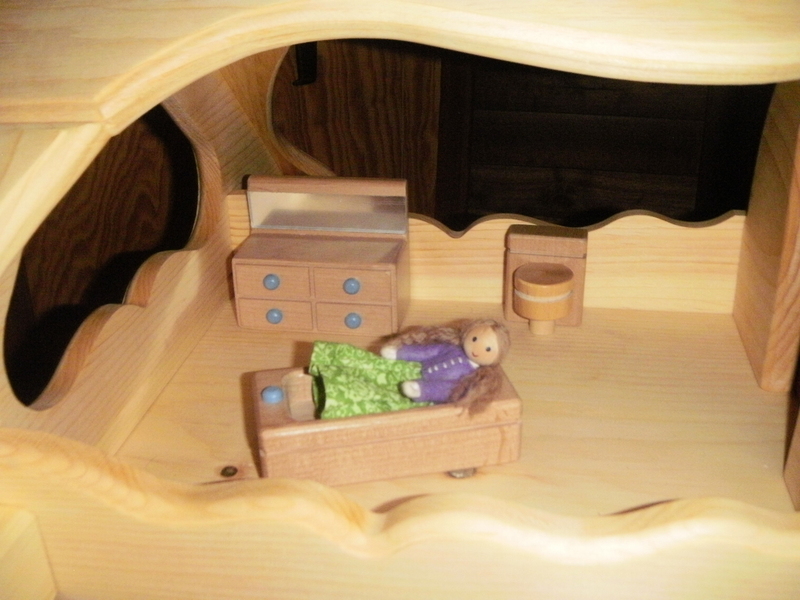 The one we have was loaned to us by a local family, made by the Husband 22 or so years ago. We are the 5th family to enjoy it in that time and it will likely be enjoyed by several more families when we’re done with it. I like to tell that story whenever someone complains to me about the price of the wooden kitchens that are handmade in the US. They send me links to made in China ones for under $100 & want to know my thoughts on them. I will never give my blessing to cheap, particle board, brightly painted, made in China offerings when you can get fabulous, solid wood, handmade in the USA offerings such as Jenny’s kitchen, for under $170!!! They truly can last for decades, and knowing that your money is going to support a fellow American family is worth a few dollars saved up front. Your purchase will hold its value & can easily be resold on Craigslist, etc when you’re done with it, if you have no one in your family to pass it on to. They offer numerous wooden kitchens for under $200, which is a great price & the most affordable I’ve seen among the quality, made in USA options on the market. Anything over $100 ships free, which is a huge saving as my box weighed 30# & of course was bulky! The cost of shipping an assembled dollhouse or kitchen would be insanely expensive, so there’s really no choice but to have the consumer put it together. All that being said, I had my eye on a dollhouse. 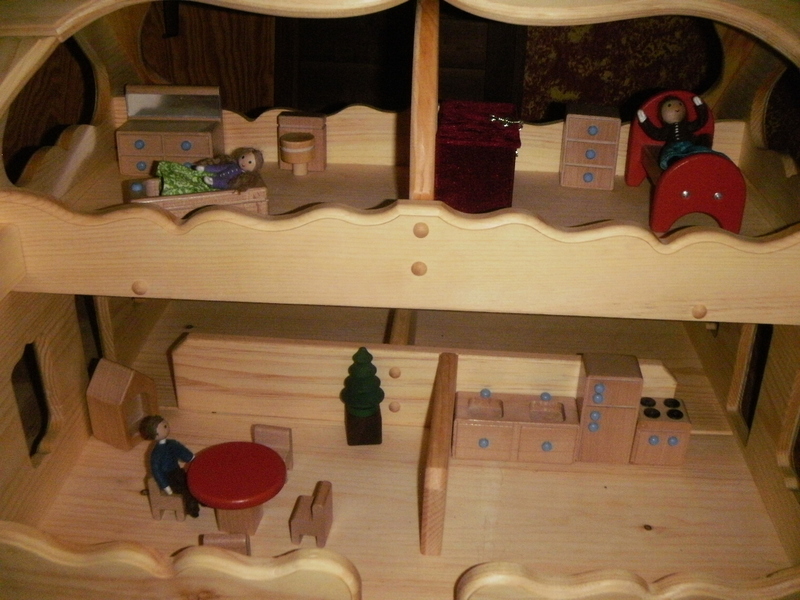 If anyone reading this thinks dollhouses are just for girls, you’re very wrong. My Son, who just turned 3 (in March) has always taken a great interest in the dollhouse at the local library we go to Story Time at, and I’m assuming his baby Sister will enjoy them as she grows up as well. The one they have at the library is made in China as are the popular Melissa & Doug offerings. So, finding a few made in the USA options at Elves & Angels made me very happy & I knew I wanted to add one to my family at some point. I offered to chip in some money towards it, as the one I wanted was a little more expensive than the kitchen I was offered, and I didn’t expect them to give me a dollhouse for free. 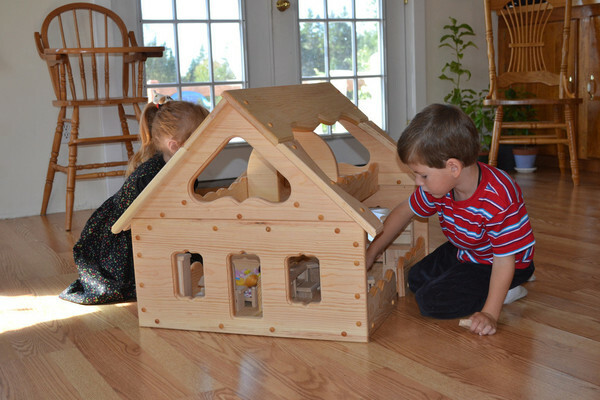 I did get it at a very discounted blogger special price, but not completely free, for the record 🙂 I chose the Maine dollhouse, which sells for $229, as I liked the open floor plan which means multiple children can play with it from different sides. They also offer another option that is gorgeous & I would’ve been thrilled to own as well, and that sells for $199. I told myself I was going to set up the dollhouse, but when the time came & I had a super excited 3 year old there anxious to see it set up, I asked Dada to please do it. He’s a very experienced carpenter, and after laying everything out & reading the directions it took him 45 minutes to set it up, not including putting the final pegs in to cover up the screws. It probably would’ve taken me 4 times that long, but I’m certain I would’ve been able to do it if I had to. It comes with a DVD to guide you through the assembly as well! You can tell that a great deal of thought, and trial & error went into making it as easy as possible for the consumer to put this together. Had it snapped together in 3 pieces & 2 minutes, I would have to question its quality. I am very, very impressed with the care that went into making such a quality product so easy to put together. It is very solid & extremely, extremely high quality. The one & only thing it’s missing is a set of stairs, my 3 year old looked at me one day & said “Mom, how do they get upstairs” 🙂 So, for now they jump real high! But my Hubby is going to customize us a set of stairs for it. 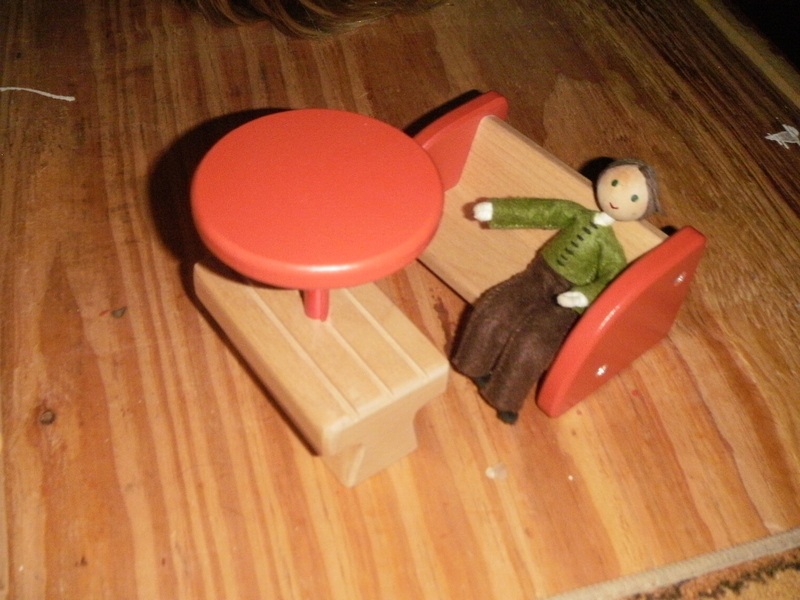 I saw they also offered adorable furniture for it, but then realized it was made by Plan Toys in Thailand. I was worried I wouldn’t be able to find a made in the USA set of furniture for it, but knew if anyone had it Pure Play Kids would. 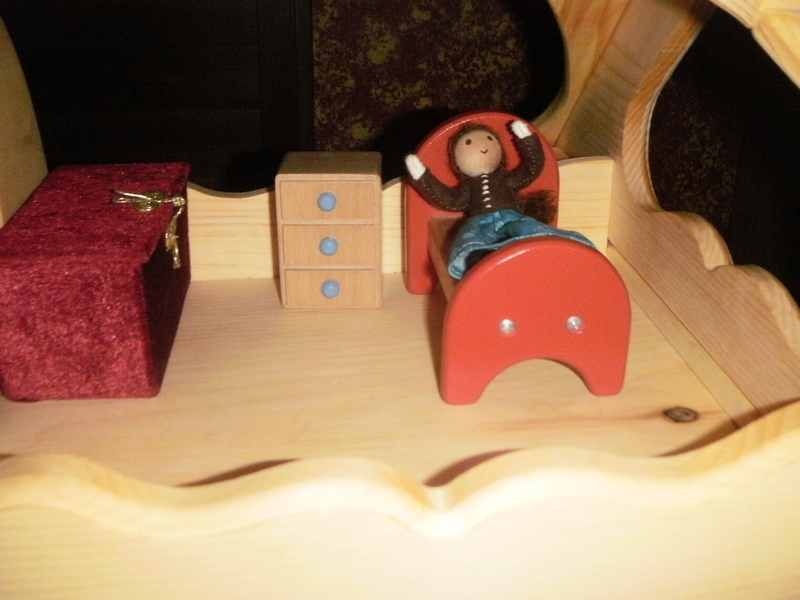 I hopped over to their page, and within minutes had my set of furniture ordered for it (turns out it’s actually made by TAG Toys, another vendor on my Safe Toys List). It’s cheaper via TAG directly, but I do have a coupon code for 15% off your Pure Play purchase: ECOUSA15 for 15% off your entire order, good through all of 2014. Then, on to the family that would reside in this new house. Elves & Angels offers dolls made by both Plan Toys, a European Waldorf option, and some made by Wildflower Innocence (who contacted my originally). As that was the made in the USA offering, I sent a message to Suzanne & asked if she’d be interested in donating a family for my new house. Turns out she’s the daughter of David, the owner & master craftsman behind Elves & Angels (she’s 1/12 children! 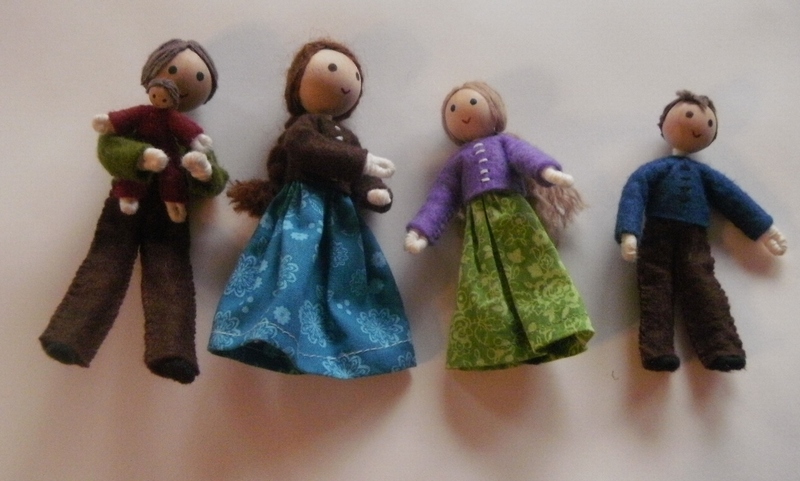 ), and she agreed to send me the Natural Family to do a review on & share with you (sells for $103.95 on Etsy). I could not be happier with the family she sent me. I absolutely adore it! They are made with a base of wire with yarn & felt clothing over the wire. This means they are bendable, which is just awesome for playing with them. They are so incredibly well made; you can tell a lot of love went into them. I cannot stress how much I love them! Since receiving the family, I’ve already placed & received an additional order which will be in my children’s Easter baskets of a couple of the Birthday dolls, a gorgeous fairy, and a custom made boy doll. Please take a look at what she offers & I think you’ll agree that she is very talented. For the price she’s asking, the fact that these are made in the US & not Europe or China, the quality way in which they’re made, you will be very hard pressed to find anything comparable, believe me, I’ve looked!! http://wildflowerinnocence.com/, her Etsy shop: https://www.etsy.com/shop/WildflowerInnocence?ref=shopsection_shophome_leftnav and she’s on FB as well! I have a pretty lousy camera, a photo does not do these justice, but this gives you an idea of size & let me tell you, they’re just ADORABLE!!!! In conclusion, I’m beyond excited to have connected with both David from Elves & Angels, and Suzanne from Wildflower Innocence. Having grown up in a small, family-owned & operated business myself (my dad owns a flower shop & 3 greenhouses), I know that it instilled many values in me such as supporting others on similar ventures, the value of hard work & sacrifice, and family values. Please browse Elves & Angels FB page to see many fabulous photo albums from around their shop & you’ll see their family at work, bringing us the very best of what America has to offer! I will also say I know many of you can’t afford to buy this out of the blue, but it’s never too early to start thinking about a Birthday or Christmas. 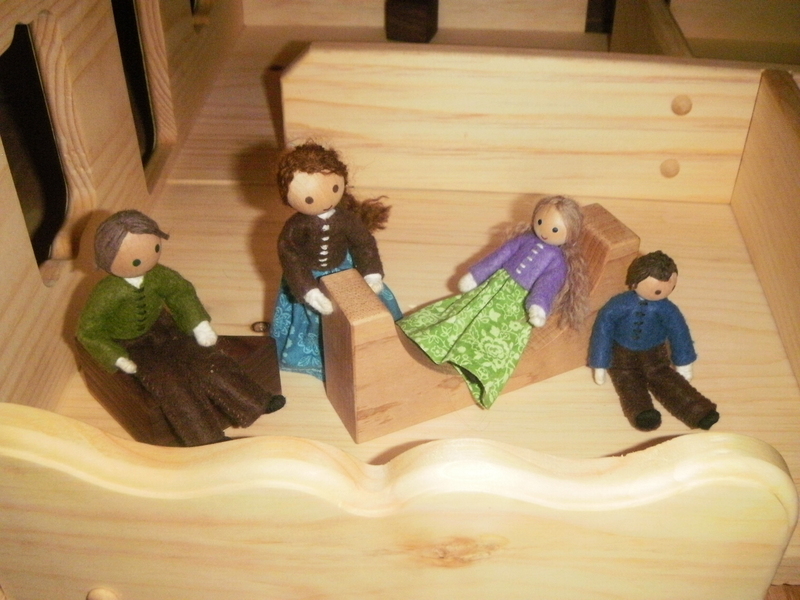 If you start saving a little towards the dollhouse, buy the furniture & the dolls when you have a little extra, it could be doable for many of you. And the quality with which these products are made ensure you’ll be enjoying your purchases for many, many years, if not generations to come! You get what you pay for, and quality over quantity are 2 of the mottos I live by!